The story behind the name: Canis Major, "great dog" in Latin, is a constellation built around Sirius, known as the Dog Star, the brightest star in the sky. The star Sirius had significance for early civilizations. The dawn rising of Sirius predicted the annual flooding of the Nile for ancient Egyptians. That event signaled the beginning of the Egyptian new year and was associated with the return to the upper world of the Egyptian God of the dead, Osiris. Greek and Roman legends involving dogs are associated with Canis Major. One is linked to the legends of Orion the hunter. Canis Major is thought to represent the larger of his two hunting dogs (the constellation Canis Minor is the smaller). In another, the constellation is linked to the story of Laelaps, a speed hound that was placed in the heavens after being caught up in an endless race with an unbeatable fox. 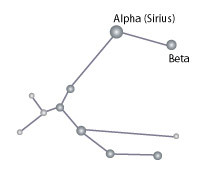 The constellation traces a dog seen in profile, with Sirius representing either the dog's eye or nose. In ancient Indian legend, the stars in this constellation are also linked to the Orion constellation, but the roles are reversed: Canis Major is seen as a deer hunter who is chasing a deer represented by the stars in Orion.